Yahya Jammeh defeated in Gambia election. 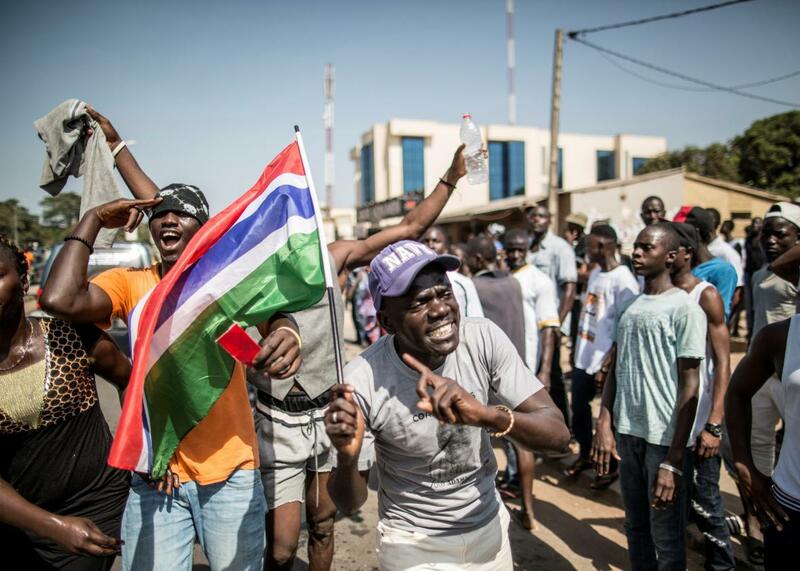 A man waves a Gambian flag as he celebrates the victory of Gambia’s opposition candidate Adama Barrow on Friday in Serekunda, Banjul. President Yahya Jammeh once said he would rule the Gambia for “a billion years” if God willed it. God, evidently, had other plans. Jammeh took power in a coup in 1994 and has ruled the Gambia, a narrow strip of land nestled within Senegal, since then with little tolerance for dissent of any kind. Torture and forced disappearances have been common, and it’s dangerous to be a journalist, a human rights activist, or an opposition politician there. He won his last election in 2011 in a landslide, and while he faced a stronger than normal opposition led by property developer Adama Barrow in Thursday’s election, there was little hope that he would lose, or if he did lose, that he would concede. The internet, international phone calls, and demonstrations were banned in the runup to the vote, as were international observers. But, shockingly, when all the marbles that Gambians drop in barrels to cast their votes were counted, Jammeh lost to Barrow, 45.5 percent to 36.7 percent. More surprisingly, it looks like Jammeh is conceding: He hasn’t made a public statement yet but called his successor on the phone to discuss beginning the transition process. Jammeh was both erratic—known for peddling an herbal AIDS “cure” of his own invention—and cruel: He threatened to “slit the throats” of gay people and passed a law punishing homosexuality with life in prison. With the economy deteriorating, particularly after the overthrow of his patron Muammar Qaddafi, Jammeh increasingly resorted to attention-grabbing moves like pulling the Gambia out of the commonwealth and the International Criminal Court and declaring it an Islamic Republic. I guess that wasn’t enough to save his presidency. Barrow campaigned as a reformer but is a political newcomer so some wariness is warranted, but for now Gambians are justifiably celebrating. I’m not sure anyone would have picked the Gambia to be a rare bright spot for democracy in a very dark year, but that’s 2016 for you.